Our company started out as an installation company in Vermont. Summers are very short and winters are very long in Vermont. To stay a viable company, we had to figure ways of working through the winter. Cold Temperature Cure Resins can also be used as a super-fast setting Resinous Mortar or Coating at normal temperatures. Our Cold Temperature Cure Resins used at normal temperature give you quick turn around time for small jobs, or larger jobs that require a short turn-around time. 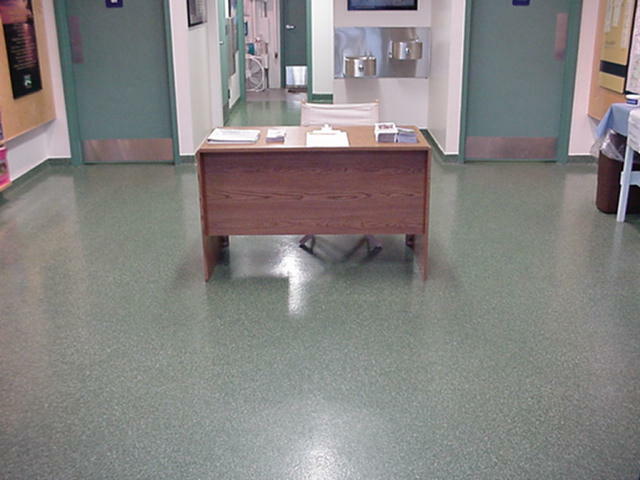 Cold Temperature Cure Epoxy Resins allow installation to be done at low temperatures as low as 35°F., expanding your epoxy coating and epoxy flooring installation season. Epoxy.com Cold Temperature Cure Epoxy Resins can also be used in cold storage areas like food processing areas, where the temperature cannot be raised higher than 35° F or so. Normal cured epoxy typically requires 50°F or more. Product #10 Cold Temperature Curing Epoxy Mortar Resin is a 100% solids epoxy has a low modulus of elasticity (flexibility) and is Low Viscosity. An adhesive used as a binder for epoxy mortar systems in patching and grouting applications, as a seal coat for non-skid surfaces outside, and as a primer to insure high bond strength for coatings and patches. Product #24 Cold Pigmented Epoxy Mortar is a Cold Temperature Cure is a multipurpose colored epoxy binder for Epoxy.com Mortar Systems This all purpose epoxy resin is characterized as an excellent general purpose material with good clarity and color retention. It is essentially odorless and can therefore be used in occupied areas. Product #28 Cold Cure Epoxy Mortar – is a honey clear, multipurpose colored epoxy binder for Epoxy Mortar Systems This all purpose epoxy resin is characterized as an excellent general purpose material with good clarity and color retention. It is essentially odorless and can therefore be used in occupied areas. Product #224 Cold Cure Water Cleanable Epoxy Mortar Resin is a user friendly, water cleanable, 100% solids epoxy grout and adhesive. Used for grouting ceramic tile, brick pavers, and stone, it is supplied in pre-packaged kits containing resin, hardener, and (in the Epoxy.com Product #225 Water Cleanable Epoxy Mortar Resin Kit) mineral fillers that produce a dense, uniform seal. Typical applications for #224 require resistance to thermal shock, chemicals, and heavy traffic including meat packers, breweries, canneries, bottlers, CIP areas, and pharmaceutical formulators. Product #225 Cold Cure Water Cleanable Epoxy Mortar Kit – includes Epoxy.com Product #224 along with the aggregate. Mix the three components together for a ready to use system. Methyl Methacrylate (MMA) used in Cold Temperatures. Virtually all of our MMAs can be used at cold temperatures, with additives that we provide you with that you can add when field mixing your individual batches. Check out the individual technical data sheets for the MMA products for how. We have a complete line of MMA products, so please check them out. Our company offers a wide variety of materials that can be used for your low temperature and cold cure application. These include Cold Cured Epoxy and virtually all of our Methyl Methacrylate Resins (MMA) with the proper additives that we supply. Please contact Epoxy.com Technical Support Department for assistance in providing you with the right resin product for your job.